For the March collection, I took my inspiration from the Queen City Art Swap's "Faerie Tale" theme. I decided to focus on castles and I tried a new medium... ink! Ink is a lot of fun to work with, but I found there's a steep learning curve! My first castle "Shadows and Mist" came out very nice. I love the fluidity of the bottom of the castle and the softness it adds to the rigidity of the rest of the castle. Next is "Dripping Courage" I love this lavender! This painting didn't turn out as fluid as I was hoping, but I do love how the drips build an under structure to this castle. Another purple castle, "Above the Haze" is a definite favorite! This photo shows the iridescence of the ink. I love how this castle appears to have been built on a cloud! This one is titled "The Remnant" and I was playing with the ink in a way that made it lighter or darker in places. I think the ink really excels at this and I love the texture that emerged. "Amethyst Towers" is the only one I did not use iridescent ink on and I loved the look of it so much that this is the piece I chose to keep out of the ten piece collection. This deep purple marbling just stole my heart and I couldn't list her! This one is titled "Emerald Towers" is one of the shiniest castles and I love that green glow. 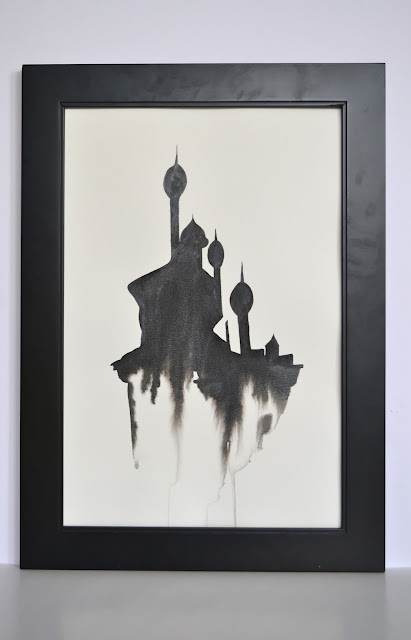 The ink came on very thick and I think the solidarity of the towers offers a juxtaposition to the flowing "roots". Another favorite, "Garrison", also really shines in the sunlight. That iridescent ink really steals the show sometimes! 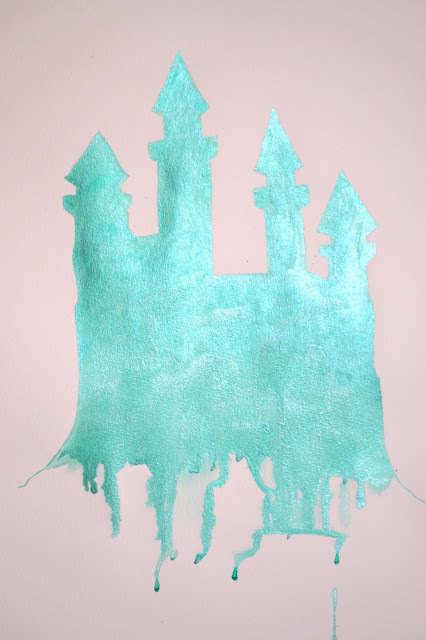 I love this one for the silhouette of the castle and the way the ink gathered towards the bottom, but refused to drip down. "Prim" was an experiment with the windows, which I realized that I didn't like as much, at least with this medium. I feel like the ink needs more space to flow and not be constricted by adding in too much detail. Lastly, "Let Down Your Hair" is the piece I sent off to my Queen City Art Swap recipient. I love how this piece turned out with the minute details and all the texture that the ink had to offer. I hope my partner likes it as much as I do! For more photos of these paintings (especially in the sun and in the shade! ), click on the link of the title, which will take you to my shop where you can browse and buy. I hope you've enjoyed the collection for March!